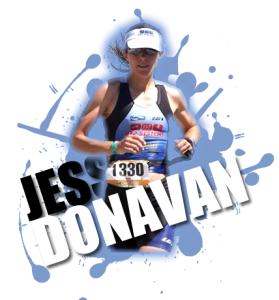 Jessie Donavan is a full time professional triathlete and mother of 3 committed to reaching the highest level in long distance triathlon while inspiring others to never give up on their dreams. Jessie also works full time as an analyst at the University of Vermont. Jessie’s first race was a local 4 mile running race at the age of 7 when she surprised everyone by beating a large portion of the field. From then on Jessie competed in anything and everything she could find focusing on x-country skiing and competing at the top level of the sport. In addition to skiing Jessie played Varsity soccer, ran track and competed in running and trail running races in her off seasons. After graduating from college Jessie turned her interests toward long distance hiking, always looking for that next challenge, and hiked the entire Appalachian Trail from Maine to Georgia. At the age of 25 Jessie’s focused shifted to motherhood and over the next 6 years she gave birth to 3 children, Griffin, Eliot and Ava. It was during these years that Jessie entered her first local sprint triathlon and she immediately knew that this was the challenge that she had been looking for. Jessie’s dreams of being a professional athlete were reignited and she made the decision that when her children were old enough she would commit herself to triathlon full-time. Between the years of 2009 and 2012 Jessie exploded onto the local triathlon scene, setting course records in nearly every triathlon she entered, always with her husband and three children at her side. 2010 was Jessie’s first year of stepping into the ½ IM distance and she qualified for 70.3 World Championships right away and ended the season with a 2 nd place finish overall in the 30-34 age group. In 2011 after finishing as the top amateur in numerous 70.3s she got her pro card and finished 2nd OA in her first Pro start. In 2012, Jessie’s first season as a pro she won Ironman Lake Placid and Ironman Mt. Tremblant and finished 2nd at Ironman St. George. very cool…. here’s to a great 2013 season! I adore you! Honestly, I’m so totally impressed with your decision to go professional. I hope you realize just how much of an inspiration you are. Looking forward to follow your 2013 season and best of luck with your training. Thanks so much for the nice note! Great to hear from you! I was thinking of you when I was in the line in S. Africa. Best of luck with your season. I was reading national news when I saw your name and thought it was a familiar name from Very long ago…Just wanted to congratulate you on your amazing accomplishments.